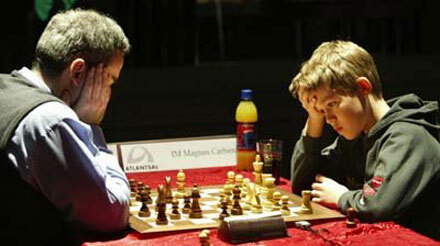 At Reykjavik Chess Tournament of 2004, a “kid vs beast” match took place. A 13-year-old player faced Garry Kasparov, the greatest chess player in the history of the game. At move #30, Kasparov had to defend himself with serious risk of loosing the match. He was lucky to escape with a draw. Full report here. Eight years later, “the kid” became “the beast”. Magnus Carlsen is now the #1 chess player in the world, with the second highest ranking in history (after Kasparov). Yesterday the “new beast” played an interesting game with a “new kid”. Carlsen played ten simultaneous games with randomly selected players from the Marshall Chess Club. To everyone’s surprise, after easily defeating nine of them, the only player still fighting was an 8-year-old named Daniel Levkov. I love when little kids show extraordinary talent and achieve little miracles like this one. If some day I read in the papers that Daniel Levkov became the next #1, I’d smile and remember this episode. And if he decides to quit chess and become a musician, I’d also enjoy the idea of him telling his friends: “My dad taught me to play chess. When I was a kid, I forced the best chess player in the world to try his best to beat me”.